I love this little thing! If you've ever needed something to get you motivated to move this is it! I never realized that maybe I do need to move around some more daily. I am a stay at home mom, so I do alot of my walking around the house. But it encourages me to move around more and do tasks that require walking. I love this so much I am going to get one for my mom. She is a nurse and I know she can easily make her steps daily. She would love it! The first day I received the Switch2Health® S2H STEP Pedometer, I immediately attatched it to my waistband on my jeans. I puttered around the house a little bit, and then my husband and I went to Menards. After walking around the store for only 10 minutes or so, I looked at the pedometer and it registered that I had walked 10,000 steps. There is absolutely no way I walked that much, so I don't believe the meter is too accurate. Also, I literally picked the pedometer up off the floor 3 times while in the store, as apparently the little clasp isn't tight enough to stay attached. this is very useful in keeping up with your activities. I like this! The concept is great -- walk with your S2H pedometer on, and then reap rewards (beyond just health/mental benefits) for doing something good for your body. The reason why I'm giving a 1 star is because: a) my S2H stopped working after 2-3 months; and b) I've spent a week trying to contact Customer Service to no avail. S2H really needs to "step up" their customer service!!!! I just currently tried this product. It works great and counts great. I also see you get a code to enter once you reach so many steps. Its an average pedometer. I liked that it came in a neat color green. It was simple enough to use. I like the idea of getting points that you can redeem for rewards, however the rewards are not too enticing. The product was easy to operate and I like the large display. The readings weren't the greatest but that is the case with a lot of pedometers. Unfortunately, after only a month mine broke after a drop onto my wooden floor from about 3 feet high which I thought was odd. The corner of the display cracked and the display got distorted beyond use. It was fun while it lasted, but I would not invest in one. I'm suprised on some days how much I walk and how much I don't on other days! Can't wait to wear it more because the weather is getting so nice out! Easy to wear as well!! This has to be the one item from Cravebox that I use religiously. I clip it on the pocket of my jeans every morning and there it stays until I get undressed at night. Amazing to see how many miles can be covered just doing daily tasks. I love the points incentive (whoever thought of that was a genius) it is extremely motivating. My little S2H Step Pedometer is part of me now. Great tool to prompt exercise. Love pedometers to track how many steps I walk (or don't walk due to my job) each day. I found that putting my pedometer inside my pockets help keep in from falling as they do un-clip very easily. Fun little gadget--while it worked. Broke after less than one month. Would not recommend. 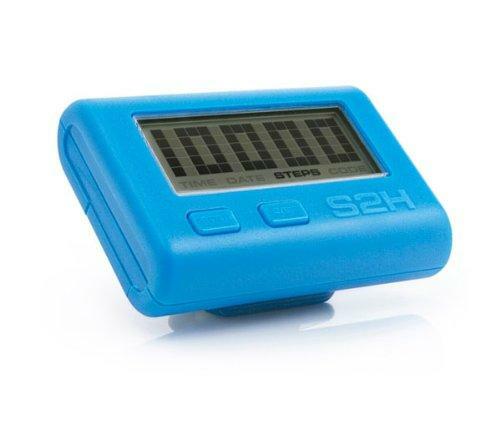 I love the S2H Step Pedometer. It has motivated me to move a little more than usual and get my 10,000 steps a day. I love how you get achievement rewards for hitting certain milestones. I just got an achievement award for logging 7 days in a row of 10,000 step codes. I wear the pedometer all day long. I work full time in an office and get quite a few steps in just by walking around the office. I also will go for a short walk on my lunch hour on the days I don?t get to the gym. Yesterday after work I still needed to get 5,000 steps in, so I came home, bundled up and took my cockapoo for a 2.5 mile walk. Probably would not have done that without the pedometer. Most mornings I do go to the gym and run/walk 4-5 miles, so am normally ending the day over 10,000 steps. Getting rewarded to walk is an extra perk. I also love setting my ranking moving up among all the other participants.  Love the craveboxes. Thanks for giving me the opportunity to try all these new products. I was excited to get a pedometer in the box. I clipped it on and started walking. It was great for the first few days, though it kept dropping. I think the clip is not that strong. While walking from the store to the car, it came undone and dropped on the pavement. The numbers/display got all messed up. I replaced new batteries and the display was still messed up. So, the pedometer was good while it lasted.